In this article, I am going to introduce how to create a three-dimensional sound waveform from a sound waveform video, without using scripts. We will use 3 softwares, but it’s not so difficult so I hope you find this article helpful! The Unity project that I introduce in this article can be downloaded from here. The “rittaionseihaikei” folder in “STYLY_Examples” is the one we are going to use. ( You can use any video edit software if you can create a sound waveform video) Please confirm that X264 is installed here. Create a project, select the resolution size ( I used 240×240 so that the file size remains small ). Then, drag and drop the audio file into the scene. Next, right click in the Adv.Edit window and insert the sound waveform from insert media object. Edit the expansion rate and wavelength height so that the soundwave fits the screen size. Export the video using x.264. First, press Shift + A, select Mesh, and create a Cube. Change to Edit mode from Object mode, press A to select all, and press Ctrl + E to mark seam. Open the UV Editing window, press u to UV edit. Then, press I to select a face, select tool→UV tool→pack island and spread the face. Once you confirmed that the polygons are subdivided, export the object as a FBX format. Import shader forge ( Which you can download from here → https://github.com/FreyaHolmer/ShaderForge ), and create a shader that changes the vertex position according to the texture color, as in the image below. It is included in the sample project, so you can just download it from there. Now, we are going to create a three-dimensional sound waveform in the Unity scene. 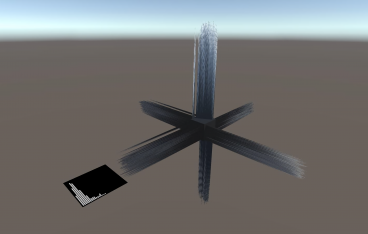 Import the soundwave video and the Cube object from previous steps, and create a material with a Unlit/Texture shader applied. Next, insert a Quad into the scene to use to display the audio soundwave. Apply a material with Unlit/Texture applied to the Quad, so that the soundform video will not be affected by lighting. Create a Render Texture within the project, and attach it to the Camera’s Target Texture. Set the Render Texture size as 720×720 ( Any size is ok if it is not too small ). Create a material for 3D sound waveform, and apply the shader you created using shader forge to it. Then, add the Render Texture to the Material inspector. The 3D sound waveform is complete! Good job! It might have been difficult a bit, but by understanding the process, you can utilize your knowledge and create any form of 3D sound waveforms!